On the 22nd of June 2014 we were very proud to announce that Sweet Creations has opened in New York. It has been such a big excitement in our office. The staff from London flew to New York to train the staff in America to produce the same high level of standard made sweet trees and outrageous creations. We have met with numerous companies to introduce our product range to them. I have to say we made a really good impression on whoever we met with. We have already been booked for some functions for large blue chip organisations and parties. We have a fantastic team working in New York who are dedicated and very creative. We will be offering Regular sweets and chocolates as well as vegetarian, Kosher & Halal. I will keep you posted as to our progress in New York. Hi Everyone, I thought that I would share some of our new sweet tree creations with you. 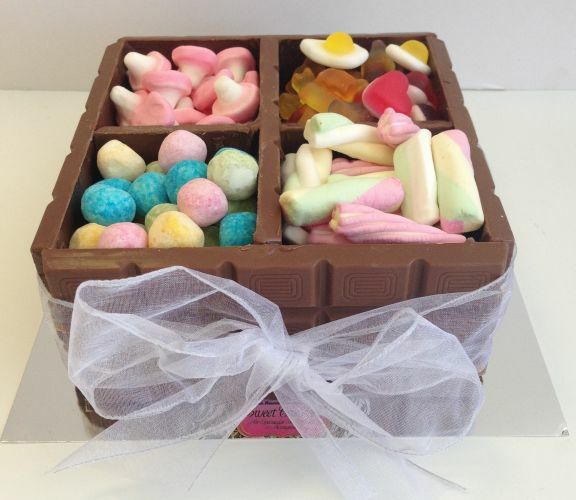 We have the fabulous chocolate treasure sweet box. A box made entirely out of milk chocolate and divided up into 4 sections and filled with a variety of sweets. This chocolate box is also available to order in dark and white chocolate. This chocolate treasure box will be available in September to be filled with dried fruit nuts and chocolate. Over the Christmas season and colder months your will be able to purchase this filled with a variety of chocolate. Have a look out our new selection of sweet trees and edible gifts. For all you chocolate lovers out there we have the new Guylian sweet tree to compliment the Ferrero Rocher and Lindt sweet trees.